A collection of nine different stories loosely based on classic fairy tales but set in modern day. One of my favorite kinds of stories is the re-imaginings of old fairy tales. The master of fairytale retellings, in my opinion, is Gail Carson Levine. In a way, I’m such a huge Levine fan that I don’t think Francesca Lia Block’s book stood a chance right from the start. I was hoping for more of the same unique, empowering, totally delightful perspective I found in Levine’s Princess Tales. But with that style firmly implanted in my brain’s “LOVE IT” section, I could never quite fall for Block’s book because the two styles are so extremely different. Here’s what I liked about this book: The rhythmic writing; it was told almost in free verse. The stories were told in the same way that a beatnik would tell them on a dark stage in a small theater while smoking a cigarette and wearing a black tunic. I also liked the daring—Block touched on much deeper emotion and passion than any of Levine’s books. She is not afraid to address abuse and addiction in a very personal way. Here’s what I didn’t like: It was at times a little too graphic for my taste; but that’s not to say that it wouldn’t appeal to a lot of young adults. It’s just not my personal preference. I don’t care for the gritty L.A. underworld setting, with reference to drug use by young kids in such a way that makes it sound like an understandably necessary part of life if you are a victim of abuse. I don’t think all victims of abuse must inevitably become drug addicts and prostitutes. But, again, this is a world that I can’t fairly comment on since I’m neither a victim of abuse nor a teenager living in L.A. There is no denying that the writing was high quality; it’s just the subject matter that I wasn’t crazy about. 2 ½ boots. Just because it’s not my idea of a great book to curl up with doesn’t mean I don’t think teens would enjoy this. I do think Block is extremely gifted with language and writing style. 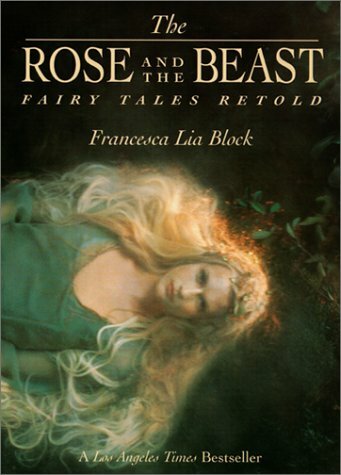 A friend once highly recommended Block’s first book Weetzie Bat to me and even though I didn’t love The Rose and the Beast, I’m still very open to reading more by this author, if only to enjoy more of that unique lyrical style she has.